FedEx and UPS—two of America’s biggest employers—have been publicly pushing tax cuts as job creators even as they plan to spend hundreds of millions of dollars for a coming wave of automation at their distribution centers and along their delivery lines, corporate documents show. Neither company has said what effect their automation plans may have on their job numbers, but both FedEx and UPS are also actively developing new technology designed to expand automation, according to patent applications reviewed by TYT. One UPS executive told Wall Street analysts new automation initiatives currently being planned will be coming online as late as 2020. Following last month’s tax-cut proposals put forward by congressional Republicans and President Trump, both FedEx and UPS have made statements in support of dramatically lowered corporate tax rates. The event was hosted by the Business Roundtable, a group of executives that is pushing for lower corporate tax rates. That same month, congressional Republicans rolled out a national campaign to promote tax cuts as a job-creation tool. Abney hosted and attended one such event, featuring two congressional Republicans, at the UPS Worldport facility in Louisville, KY. In addition to membership in Business Roundtable, both companies also belong to a number of organizations actively pushing for corporate tax cuts. These include the RATE (Reforming America’s Taxes Equitably) Coalition, a constellation of corporations that have banded together to promote the Republican tax plan through lobbying efforts; ad buys; writing reports, editorials, and letters to Congress; and testifying before Congress. 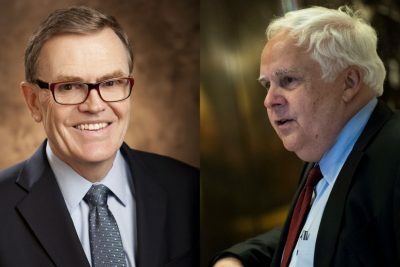 UPS is also a member of the Alliance for Competitive Taxation, while David Short, senior counsel for legal, trade, and international affairs for FedEx Express, serves on the Advisory Board for the U.S. Chamber of Commerce. Both groups maintain that federal tax cuts will generate job creation. In addition to public-relations efforts by UPS, FedEx, and their affiliated advocacy groups, both companies also employ lobbyists to push for their preferred policies in Washington. Including in-house lobbying and work done by outside firms, FedEx has spent over $5.2 million on federal governmental lobbying in 2017, while UPS has spent nearly $4.3 million. Sixteen of the 31 federal lobbying disclosure forms filed by FedEx this year list tax reform, while 12 out of 19 UPS forms disclose lobbying on tax reform, according to data compiled by the Center for Responsive Politics. In February, Smith met with Vice President Mike Pence. FedEx President and COO David Bronczek met with President Donald Trump. One investment both companies are making is in increased automation. Last November, UPS outlined plans to invest more than half a billion dollars in automating processing at three major hubs. Plans include a $400 million, 1.2 million-square-foot processing facility in Atlanta. UPS also announced a $196 million investment to increase processing capacity in Jacksonville, Florida, by 33 percent, and $175 million to double processing capacity at its hub in Columbus, Ohio, which will reportedly add 75 new jobs as a result by next fall. All three projects reportedly received local tax breaks as incentives for job creation. At its Worldport facility in Kentucky, UPS has told reporters it defines automation as meaning that workers do not touch actual packages at any point except two times: before the package enters the high-speed, computerized, assembly-line distribution system, and once it’s done. Neither company appears to be relying solely on existing technology for automating package scanning, processing, distribution, and delivery. Both UPS and FedEx are actively researching and creating new methods of automation, based on patent applications reviewed by TYT. A year before that, UPS received a patent in August 2016 titled, “Automated Loading and Unloading Items,” from the U.S. Patent and Trademark Office for the automated unloading and retrieval of goods being prepared for shipment. In 2014 the U.S. Patent and Trademark Office granted UPS a patent titled, “Methods, Apparatuses and Computer Program Products For Automating Arrivals and Departures.” The patent’s background description explains how it will reduce hours of manual work related to trucks coming in and out of UPS shipping centers. TYT identified at least 21 patent applications geared toward automated scanning, processing, or delivery. It’s not clear what effect automation will have on the number of jobs at FedEx and UPS, the ninth and tenth biggest employers in the world, respectively, according to the Fortune 500 list. Nor is it clear that current tax rates have impeded hiring. FedEx does not list its U.S. employee numbers in its SEC filings. But in its report for fiscal year 2016, it reported 353,000employees globally, up from 213,500 in fiscal year 2008. UPS went from reporting 340,000 U.S. employees in fiscal year 2008 to reporting 355,000 in fiscal year 2016. Neither company has claimed a lack of resources to hire new employees. At UPS, last year’s dividend payments amounted to $2.8 billion. It had $3.546 billion in cash on hand and paid Abney $13.7 million, according to a UPS proxy statement filed in March, up more than 20 percent from the previous year. FedEx paid Smith $15.6 million in compensation in fiscal year 2017, according to a proxy filing submitted to the SEC this September. The company ended 2016 with $3.53 billion in cash on hand. It gave its shareholders $227 million in dividends both last year and in 2015. As Smith indicated to CNBC, he expects to use his company’s tax windfall to expand those payments. FedEx did not respond to multiple questions about its plans for its tax windfall or how its spending would affect hiring. UPS spokeswoman Kara Gerhardt Ross, formerly an assistant press secretary for then-President Bill Clinton, said the company could not answer TYT’s questions because they involved “proprietary information.” Ross referred The Young Turks to UPS’ statement released after President Trump released the contours of his proposed tax plan in September.